I’m currently sitting in my old room, at the same desk where I did all of my school work while growing up. I originally planned to come out to California to have a reunion with my college roommates this weekend. We haven’t all been together for over a year and I am so excited to see each and every one of them! I ended up coming out earlier than I had planned though because my mom is putting her house on the market, so I wanted to come spend time in the home one last time before it sells. Most of my time here has been sorting through all my stuff that I left behind, determining what to keep vs not. Having grown up in that room I thought that this would difficult task. However it turned out much easier than I had thought for one reason - I am no longer the same person who used to live in there. Yes that girl is still and will always be apart of me, but since moving out, the experiences that I have had have continued to grow and evolve my personality, my dreams and goals, my likes and dislikes, and my style. So as someone who has come to value minimalism, it was invigorating to be able to part with so many things that I no longer need. I read through all my old journals - reading about my past crushes. I tried on all of my old formal and prom dresses - remembering the dances that I wore them to. I looked through my old yearbooks - hardly able to recognize myself. I scoured through my desk, finding my previous scholarship applications that outlined my hopes and dreams for my future. To my amusement, the life plan that my 17 year old self had spelled out did not end up happening. And I’m totally okay with that because I love what life has lead me to! It will be odd seeing this house on the market, and eventually selling to become someone else’s home, but I am so grateful for all of the wonderful memories that this home has given me over the years! Alright, so CUPCAKES! Surprisingly this is the first time that I have made cupcakes for my blog. Naturally I wanted to something special, so I went with my favorite holiday flavor combo - chocolate and mint. 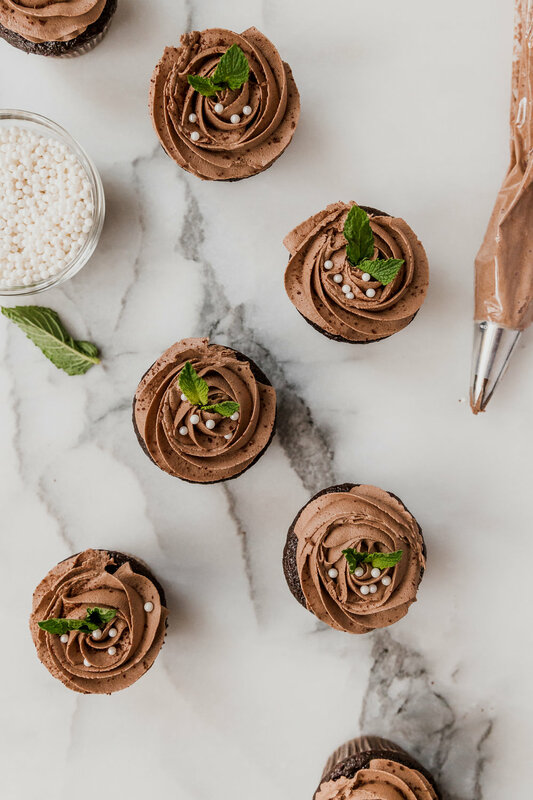 The cupcake is a classic chocolate cupcake. It has a rich and moist consistency, and the flavor is enhanced thanks to my favorite chocolate cake “secret” ingredient - fresh coffee! 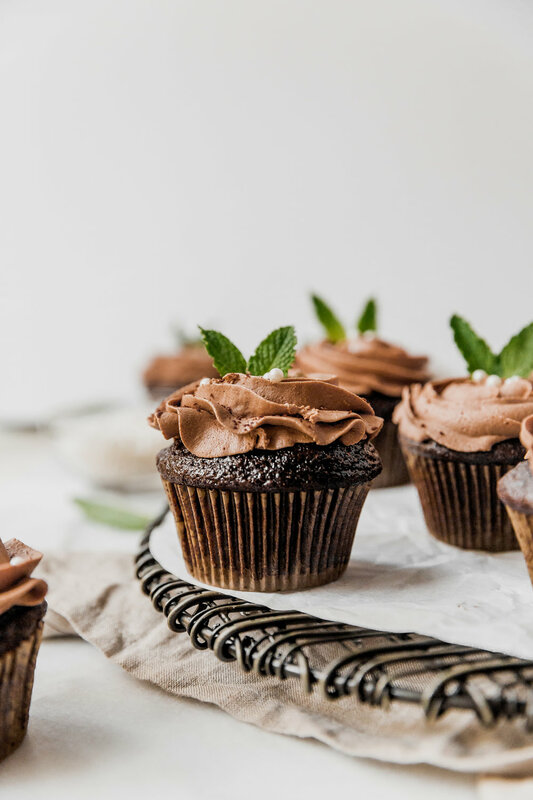 It is topped with a savory mint chocolate icing. The mint flavoring comes from fresh mint leaves, so it has an authentic taste to it. The savory mint is well balanced by the sweetness of the powdered sugar and creaminess of the butter. But if mint isn’t your thing, then you can reduce the number of mint leaves in the frosting! In a pyrex, muddle the fresh mint leaves. Add the buttermilk, and stir. Cover with plastic wrap, and refrigerate for 1 hour. Preheat the oven to 350F. Line a cupcake tin with cupcake liners, and lightly spray with nonstick spray. Set aside. In a large bowl, sift together the flour, sugar, cocoa powder, baking soda, baking powder, and salt. Set aside. In a separate bowl, add the oil, vanilla, eggs, and strained mint-infused buttermilk. Whisk until well combined. Fold the wet ingredients into the dry ingredients. Add the hot coffee, and again fold in. Transfer the batter to the prepared cupcake pan, filling 3/4ths of the way full. Bake for 20 minutes or until a toothpick inserted in the center comes out clean. Allow to cool for 5 minutes before transferring to a cooling rack. Cool completely. As the cupcakes cool, make the frosting. Using a bread knife, finely chop the chocolate. Place in a small bowl and microwave for 1 minute. Stir until smooth. If not completely melted, return to the microwave for 10 second intervals. Set melted chocolate aside. In a small saucepan, muddle the fresh mint leaves. Add the butter. Turn the heat to low medium and melt the mint butter, stirring occassionally. Allow to simmer for 10 minutes. Strain the butter into a small bowl. Place in the refrigerator until it solidifies, but is still soft. Using a handheld mixer or a stand mixer fitted with a paddle attachment, beat the mint-infused butter until light and fluffy. Add the sugar, melted chocolate, heavy cream, vanilla, and salt. Whisk until well combined. Increase speed to medium, and beat for 3 minutes. The frosting is thick, so it works best to pipe onto the cupcakes rather than spreading it. (Optional) Top with sprinkles and shaved chocolate.